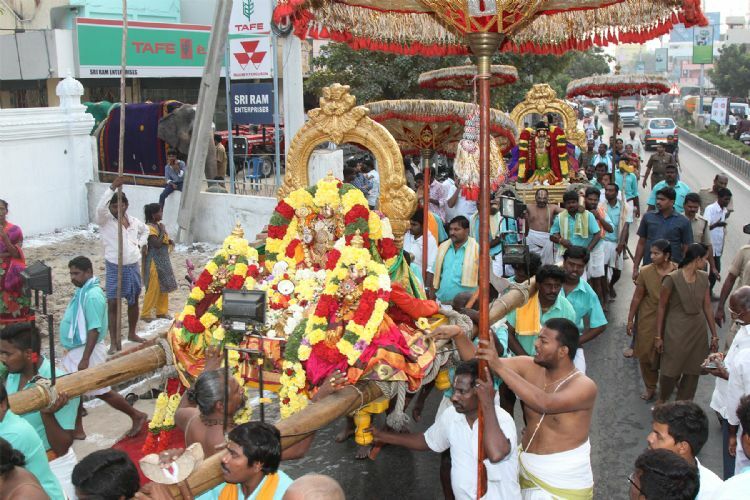 Tirupati, 17 Jan. 19: The Mock Hunt Festival Paruveta Utsavam of Sri Govinda Raja Swamy temple was observed with religious fervour in Tirupati on Thursday. The processional of Sri Govindaraja Swamy was brought to Paruveta Mandapam located in Renigunta and a pleasure hunt was performed. The religious staffs on behalf of Lord enacted mock hunt throwing weapons on wild beasts. Devotees converged in large numbers to witness this fun filled festival. Temple DyEO Smt Jhansi Rani, AEO Sri Udaya Bhaskar Reddy, Temple Inspector Sri Prasanth, Temple Archakas and others took part.